Motorists give generously at the Annual Charity Check-Stop in front of the Canadian Tire Store in Wetaskiwin. 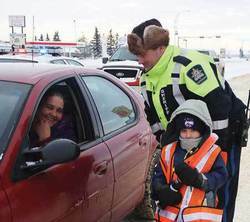 As vehicles approached the Check Stop location they were cautioned by police officers to slow down and encouraged to participate in the fundraiser. Volunteers for Victim Services and the Salvation Army were lined up along the meridian and gratefully accepted cash donations, food donations and donated toys. The annual fundraiser is in support of Victims Services, the Salvation Army Food Bank and toys for Secret Santa. As car-after-car pulled up to the edge of the meridian, the drivers rolled down their windows and the volunteers were greeted with the smiles of warm-hearted donors who dug deep into their wallets, purses, ash trays and beverage holders to support the worthwhile causes. Money was dropped into the collection cans and bags of unwrapped gifts and donated food were handed over to distribute to those in need. All were very generous including Mr. Jim Wilson, Moose Lodge Administrator, who arrived with a cheque in support of the cause. Although the Christmas holiday season is meant to be a happy and joyful time, this isn't necessarily how everyone feels at this time of the year. Christmas can be extremely stressful and depressing for many people. There are tragedies leading up to and during the holiday season and the pressures can also lead to victim abuse. Every year many people find added financial and time pressures, isolation from family and friends, loss of family and friends, separation and divorce. Some reflect on not being able to supply their family with an adequate meal. These are all very difficult to manage. Victim Services be accepting cash donations and the Salvation Army will accept food donations and toys for Secret Santa throughout the entire holiday season. (1) General Donation: If you would like to make a general donation, you can fill out the General Donation PDF form and drop it off or send it to the address shown on the website. Victim Services and the Salvation Army are grateful to the kind and caring donors who participated in the Charity Check Stop. For more information, to volunteer or to make a donation to Victim Services phone (780) 312-7287 or visit Victim Services in the Wetaskiwin RCMP Detachment.